Need Help With VRay Lighting? Finally a good school for architects and interior designers that want to learn how to make realistic 3D Renders. www.vrayschool.com will teach you the most advanced tips and tricks that only PRO 3D Artist use. IT's 7 trainigns with yearly subscription + Personal Forum Support. You can get PROFESSIONAL feedback to your 3D works and Learn by Doing! Join us today - and start learning from the PROs'! 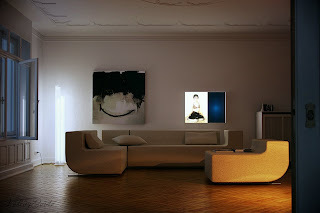 LEARN to setup you interior scene by using HDRI Maps. "Hollywood" Productions Pipeline for Arch. VIz. 3DsMax VRay and Photoshop + Plugins. -Take this Video Training everywhere you GO! about VRay HDRI Lighting & Rendering! Get it today on iTunes and Google play TODAY! Professional Post Production self-training app for architects, interior designers and 3D artists, that want to make realistic looking renders! 9. Getting Photoreslistic look – chromatic aberration, vignette, film grain, soft edges, out of focus, DOF, lens distortion, bokeh effect – examples shown with plugins and 2 additional programs that will make out your 3D renders “REAL PHOTOS”! 12. 6 Hours of LIVE – V-Ray training Recorded Webinars – we went through a lot of exclusive methods and you will see exactly how I’m correction student images in order to achieve realistic results. So, If you want to do 3D images much better than others and take your Renders to the next level of PHOTO-REALISM, this app is for you. Press the link below and get it TODAY! VRay Basic Lighting DVD - VRay Training DVD From the beginner to advanced - VRay Lighting techniques in 12 Video tutorials will teach you how to create realistic lighting with VRay 3Ds Max and Photoshop. VRay Basic Lighting - DVD Content - 12 Video Tutorials: 01 - VRay SkyPortals - 04:30 02 - VRaySky Lighting - 10:24 03 - VRayPhysCam - 12:44 04 - VRay White Balance - 14:00 05 - VRay Rendering Settings - 24:03 06 - VRay Materials - 10:13 07 - VRay Custom Texture (Photoshop Brushes) - 17:31 08 - VRay Shader - 12:50 09 - VRay Passes Combination - 50:51 10 - 3Ds Max Floor Generator - FREE Plugin - 13:08 11 - Post Work with Looks Builder - 41:18 12 - VRayHDRI Basics - 03:09 BONUSES: 1. MAKING OF FRENCH SCENE - pdf file. 2. French Scene - 3Ds Max VRay Model with complete Rendering, Lighting and Camera settings. This fundamental knowledge is a must for any 3D Artists - Learn from the best to be a professional VRay Artist. Get this DVD TODAY! and Join our VRay Community of PRO's. Hey this is amazing to see how technology develops in to something incredeble! 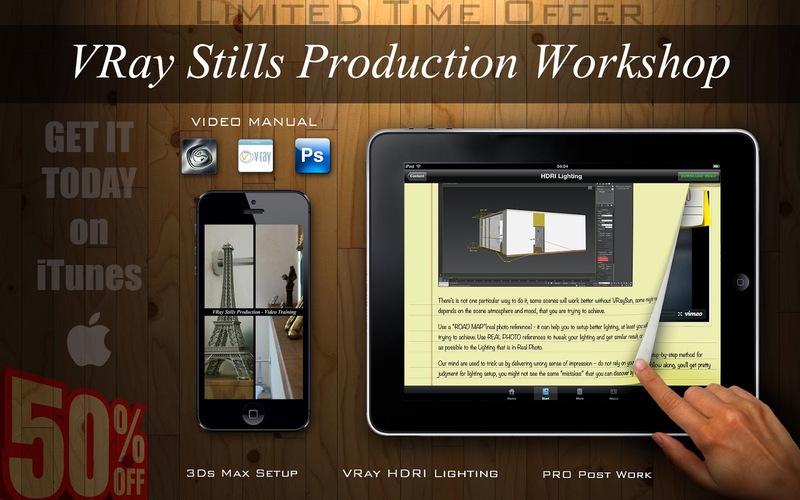 AND the FIRST VRay Training APP that being ever made! Actually this is the only existing VRay App on iTunes! With the help of this app you'll be able to grow your business and learn PRO Tips and Tricks - that were made specially for 3D Artist. Get this app here - and join the fist pioneers top lead the architectural Visualization industry, in to the Bright Future! Just remember this - If you wanna do it Right- DO it like a PRO! Thanks a lot for checking this out, share it with your friends. PRO 3D Knowledge can be Copied! I LEARNED IT from the BEST MAN in the house. There is no reason why YOU can't repeat what I'm doing! and not making a GOOD LIVING. This is all about having the right KNOWLEDGE and using it PROPERLY! Why do you think it takes so long to get THERE? To become a PRO? Well, simply because you don't have a MENTOR to follow. That can be ME :) Making it EASY for YOU to Learn! You see, I gathered all the necessary information you need to know! And this INFO will take YOU there faster than doing it Alone! Use my 8 years of Knowledge to JUMP above others. Learn to avoid FAILURE by using 3Ds Max, VRay and Photoshop. Make new CONTACTS and GROW! I take training's all the time. Cos' I wanna be BETTER! PRESS the BUTTON below and Join US TODAY! Hey Hows it going? Christmas spirit is inn the AIR! and I want to thank everybody who was folllowing me and letting me help them to improve their 3D works through my exclusive trainings. I wish you a happy holidays and a good year!